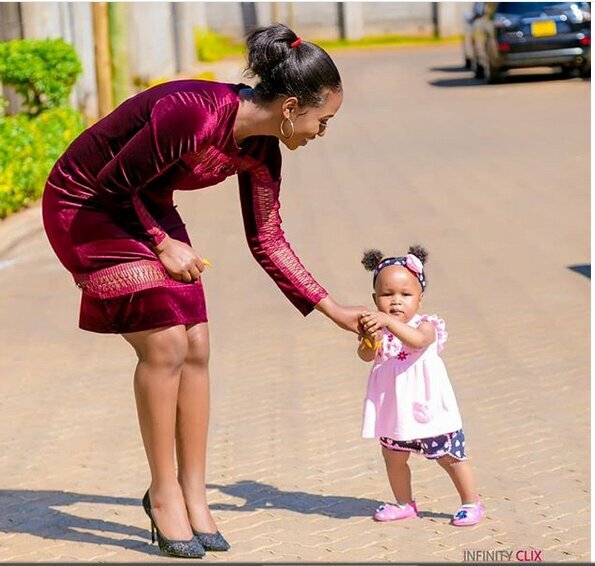 Diana Marua has jotted a heartwarming message to her daughter Heaven Bahati. The mother of one in the lengthy letter said her daughter has brought joy and happiness to her life. The amount of Joy and Happiness you brought into our lives since we first knew of your existence was/ is still immeasurable. Having you truly shows me what God’s kind of love is. A love that is so pure, a heart that easily forgives, a face that always smiles even when there’s nothing to smile about, little hands that quickly wipe tears away after I’ve hugged you. Feet that will always run to me and arms that are always ready to be lifted up. You don’t know what hate, envy, jealousy, disappointment, pride, anger, grudge is. She talked about her experience as a first-time mother and how she would break down when her baby used to cry. Diana went ahead to vow to teach her daughter the way of the Lord. I remember when you were tiny, how you used to cry and Mama would cry with you just because. How I would/ still pray for God to keep me so we could Fight the Good Fight of Faith together. See how you’ve quickly grown, we’re now walking, we’re saying mama, we’re hugging and giving each other kisses, eating from the same plate. God, I am THANKFUL. We are tasked by the Most high to raise you to be strong in Him and the power of His Might. To teach you that we live in a cruel world and that you should be ready for anything and always know that you have the Victory even before smelling the problem…. When you ever have a problem, Child… never ever run to the phone, always run to the Throne! So my baby, @heavenbahati , walk your path with pride and live to know that you have what it takes, you are a conqueror, a warrior, a Mother to the Nations and that you can do whatever it is through Christ who Strengthens you! Love you loads my Angel. @heavenbahati . The young girl recently turned one and she has amassed 109k followers on Instagram.